NASA's C-9 zero-gravity aeroplane on the upwards ascent portion of a parabolic trajectory. This McDonnell Douglas C-9 aircraft is a variant of the DC-9. It is based at Ellington Field near Johnson Space Center, Texas, USA. It flies parabolic trajectories over the Gulf of Mexico, producing a few seconds of free-fall to replicate conditions in Earth orbit. In a typical flight, 40 to 60 parabolas are flown (65 seconds each), with 25 seconds of free-fall each time. 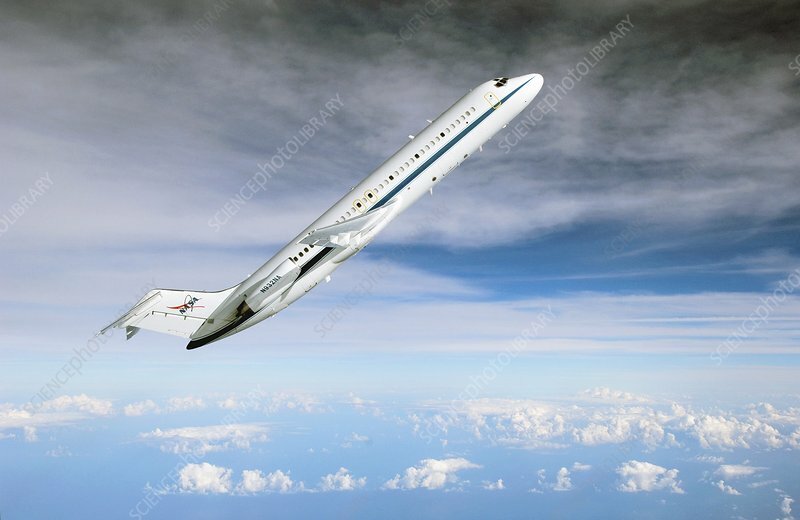 This aircraft has been used for parabolic trajectories since 2005, with its primary mission being microgravity research. Photographed on 27 January 2006.